“Multiple departments are involved in the management of the total cost of travel, not just procurement or the travel manager. That’s right – travel policy can no longer be managed in silos,” says Tshipi Alexander, head of corporate issuing and merchant services at Nedbank. In the past, one of our biggest challenges was to understand what we actually spent on travel – and to a certain extent it still is. Travel spend is included in so many different categories and there are so many threads from which we can pull data that it’s difficult to get 100% visibility of our travel spend. A good expense management system is a good start to bridging the gap between what we’re actually spending and what our travel management company’s management information reporting system says we are, but the one thing that an expense management system cannot measure is the new buzzword – traveller friction. 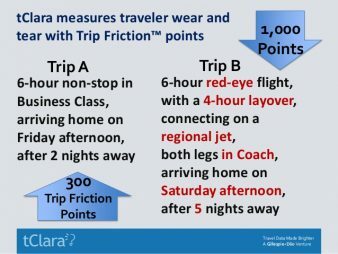 Total cost of travel = trip cost (USD) + traveller friction. Budget owners must set traveller-related goals, eg. reduce work days lost by business travellers on the road by 5% or improve staff retention by 10%. Procurement and human resources should agree on a measure for tracking costs of traveller wear and tear. The travel manager should provide travel strategy plans that link to traveller-related goals, eg. improve expense reimbursements, provide en-route booking support and offer trip hardship allowances. These goals should be monitored, the total travel costs assessed and travel strategies adjusted accordingly. 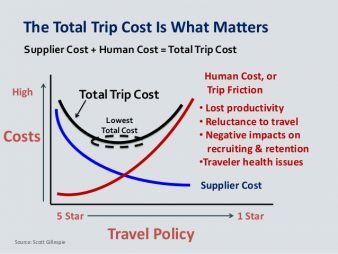 As you can see in this decidedly traveller-centric model – although you could argue that the company will also benefit in the long run – multiple departments are involved in the management of the total cost of travel, not just procurement or the travel manager. That’s right – travel policy can no longer be managed in silos. Rather, human resources, procurement, finance, travel and the actual business traveller are all involved in managing the total cost to the company. But it remains the responsibility of the travel manager to co-ordinate all parties involved. Want to read more about Gillespie’s total cost-to-company model? Visit slideshare.net/srgillesp/total-cost-of-travel-more-trips-or-better-trips.